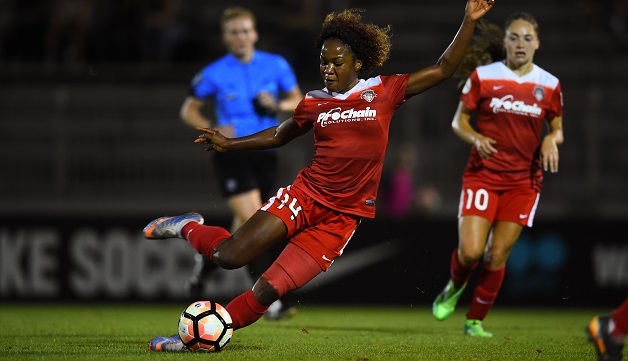 Boyds, MD (August 30, 2017) – The Washington Spirit (4-12-4, 16 pts) fell 3-2 to the visiting North Carolina Courage (14-5-0, 42 pts) on Wednesday night in front of a crowd of 2,365 fans at the Maryland SoccerPlex. Just before halftime, North Carolina managed to level the score at 1-1 when U.S. international Sam Mewis placed a header into the top right corner of the net on a feed from her USA teammate Abby Dahlkemper. U.S. international forward Jessica McDonald netted back-to-back goals in the second half to put North Carolina ahead, starting in the 61st minute on a header from the center of the box, finishing off a pass from U.S. international defender Jaelene Hinkle. McDonald struck again in the 66th minute, sending a shot from the center of the box into the bottom right corner of the net. Another U.S. teammate, forward Lynn Williams, was credited with the assist on the play as Carolina took a 3-1 advantage. Both defenses held strong the rest of the way, as the Courage held on for the narrow 3-2 win. Washington will return to action on Saturday, September 2 for a road test against Portland Thorns FC in the NWSL on Lifetime Game of the Week at Providence Park. Kickoff is set for 3:30 p.m. ET.